Applying a selection or highlight color to the cell. Adding standard accessory views, such as a detail or disclosure control. Putting the cell into an editable state. Indenting the cell's content to create a visual hierarchy in your table. Your app’s content occupies most of the cell’s bounds, but the cell may adjust that space to make room for other content. 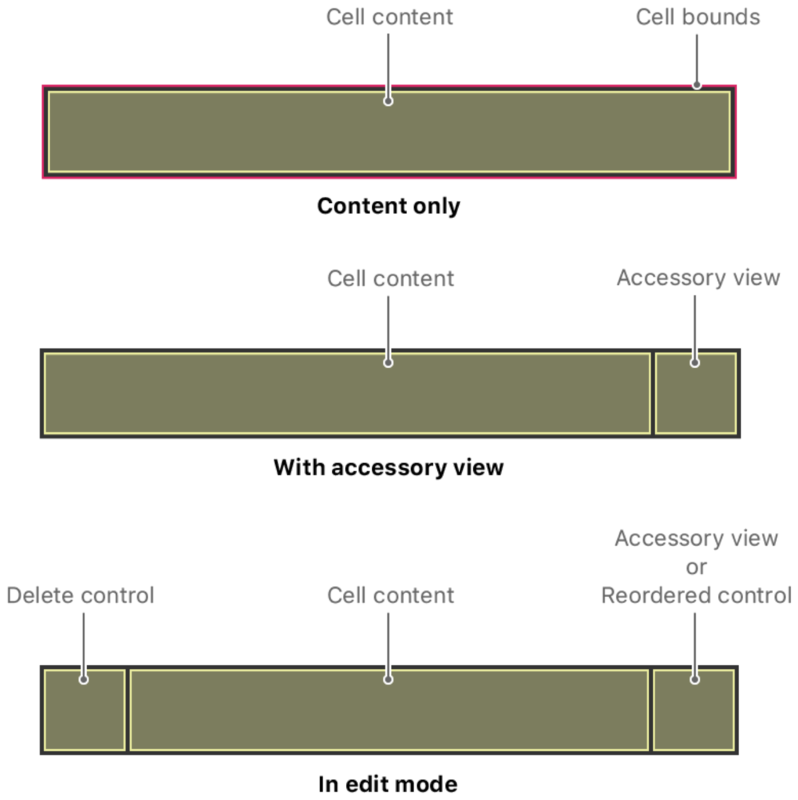 Cells display accessory views on the trailing edge of their content area. When you put your table into edit mode, the cell adds a delete control to the leading edge of its content area, and optionally swaps out an accessory view for a reorder control. Every table view must have at least one type of cell for displaying content, and tables may have multiple cell types to display different types of content. Your table’s data source object handles the creation and configuration of cells immediately before they appear onscreen. For information about how to create your table’s cells, see Filling a Table with Data. Identifier. Use this identifier (also known as a reuse identifier) to create the cell. Style. Choose one of the standard types or define a custom cell. Class. Specify a UITableViewCell subclass with your custom behavior. For the standard types, UITableViewCell provides the views for displaying your content. All you have to do is assign values to the textLabel, detailTextLabel, and imageView properties of your cell. The following illustration shows how the values you supply are positioned within the cell’s content area. If you do not supply an image for your cell, the cell distributes the extra space to the other content views. For information about how to customize the appearance of your cells, see Configuring the Cells for Your Table. A string used to identify a cell that is reusable. The content view of the cell object. The view used as the background of the cell. The view used as the background of the cell when it is selected. The background view to use for a selected cell when the table view allows multiple row selections. The type of standard accessory view the cell should use (normal state). A view that is used, typically as a control, on the right side of the cell (normal state). 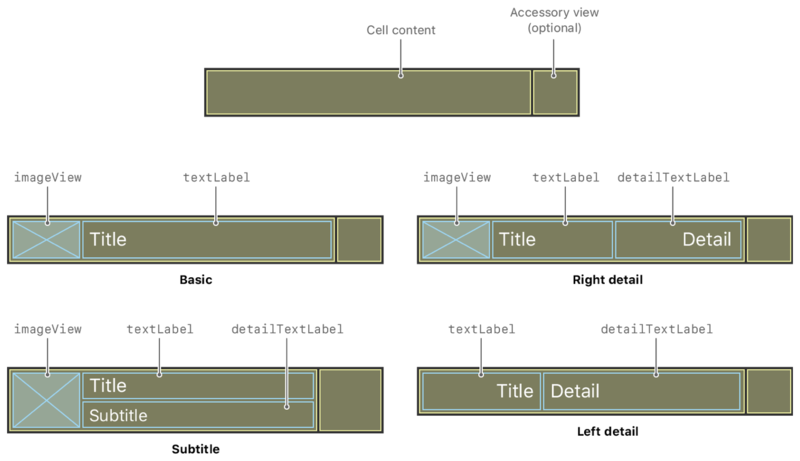 The type of standard accessory view the cell should use in the table view’s editing state. A view that is used typically as a control on the right side of the cell when it is in editing mode. The type of standard accessory control used by a cell. The style of selection for a cell. The style of selected cells. A Boolean value that indicates whether the cell is selected. Sets the selected state of the cell, optionally animating the transition between states. A Boolean value that indicates whether the cell is in an editable state. Toggles the receiver into and out of editing mode. The editing style of the cell. The editing control used by a cell. A Boolean value that indicates whether the cell is currently showing the delete-confirmation button. A Boolean value that determines whether the cell shows the reordering control. A Boolean value indicating whether users can interact with a cell while it is being dragged. Notifies the cell that its drag status changed. Constants indicating the current state of a row involved in a drag operation. Called to notify the cell that it is about to transition to a new cell state. Called to notify the cell that it transitioned to a new cell state. Constants used to determine the new state of a cell as it transitions between states. The indentation level of the cell’s content. The width for each level of indentation of a cell's content. The inset values for the separator line drawn beneath the cell. The appearance of the cell when focused. The style of focused cells.